You’re on the phone with a customer, trying to solve a problem, and you tell them you’ll do some research and get back to them “as soon as you can.” You call them tomorrow morning, proud of how quickly you resolved the issue, but they’re upset because they thought “as soon as you can” meant in 20 minutes. Have you ever had that happen? Let’s change the scenario just a bit. You call them back tomorrow morning, but they thought it was going to take 2 weeks to resolve the issue. In this case, they’re blown away, amazed that you were able to resolve the issue so quickly. Notice that in both examples, you did the exact same thing! In the first example, the customer is angry and in the second one they’re ecstatic. What was the difference? Their expectations. Ultimately, it really doesn’t matter what we do. The only thing that matters is how it compared to what they expected us to do. Recognizing this, it’s critical that we learn to be clearer in our language around expectations. When we use sloppy phrases like, “As soon as I can” or “when I have a moment” or “that shouldn’t take very long,” we’re inviting misunderstanding. Because these statements are so vague, they increase the likelihood that the other person will interpret them to mean something very different from what we mean. And remember, they’re going to judge us not on what was in our mind, but rather, what was in their mind. It’s also often important to check in with the other person to make sure their understanding of the expectations is the same as yours. “I just want to make sure we’re on the same page here. What’s your understanding of what the next steps are?” While this extra step may seem like it slows things down, it ultimately gives us far greater speed because we ensure total alignment. Sometimes I’ve found that we’re reluctant to ask about the expectations because we’re afraid they’ll be unrealistic. “If I ask the customer when they need this by, they may tell me something that’s impossible to do.” While this is a common fear, here’s the issue: whether it’s been articulated or not, they still have that same expectation and they’re going to judge our performance based on that unrealistic expectation. If we ask about it, we at least may have an opportunity to discuss it, and then reset the expectation to something more realistic. At the root of nearly every misunderstanding, at home or at work, is a misunderstanding about expectations. I was expecting one thing, you were expecting something else, and that’s why we’re angry at or frustrated with each other. 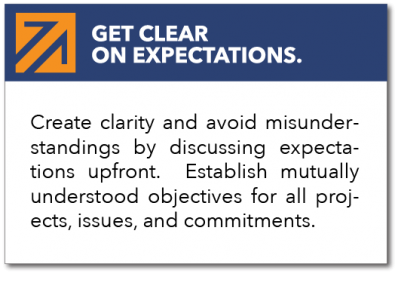 If we can become much more rigorous in our conversations, internally and externally, and ensure that we’re totally clear on the expectations, we can significantly increase our success. If you’d like to know more about how practicing Fundamentals like these and using the Fundamentals System™ can help you to create a high performing culture in your organization, just shoot us an e-mail or give us a call.